Since writing this blog post in 2012 I have launched Learn OmniFocus, a site dedicated to supporting people in using OmniFocus effectively. Some of the Learn OmniFocus content, including OmniFocus Workflows with Tim Stringer, is FREE. You can gain access to all of the content and participate in live, video-conferenced sessions by joining Learn OmniFocus. Also check out our the in-depth Holistic Productivity for Mac & iOS course that prominently features OmniFocus. OmniFocus is a personal task management solution for Mac, iPhone/iPod Touch and iPad that is designed and developed by the Omni Group, a Seattle-based company that specializes in productivity software for Mac and iOS. 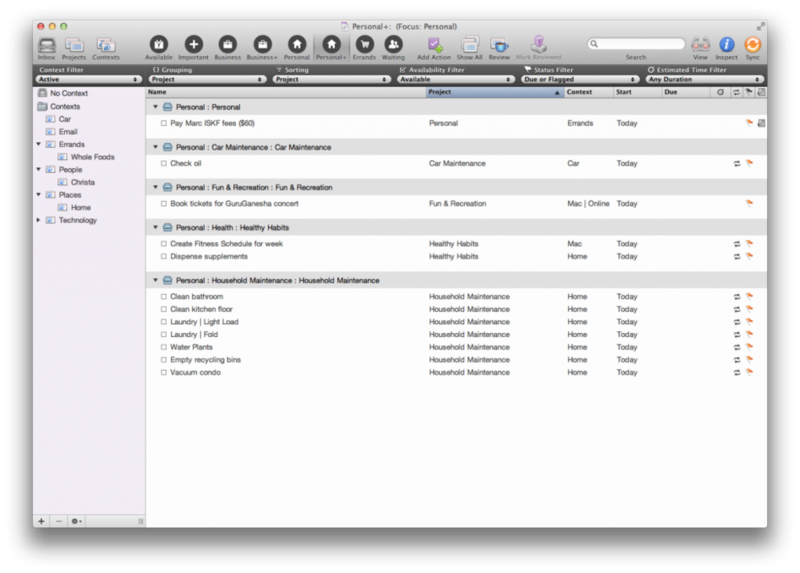 OmniFocus is what I personally use to manage both personal and business projects and day-to-day tasks. For me, OmniFocus is integral to operating with a clear mind and having a relaxed sense of control. I’m often asked why I chose OmniFocus, how I have it configured and what my day-to-day use of OmniFocus looks like. This article is all about how and why I use OmniFocus and the best practices I’ve implemented based on my in-depth study of David Allen’s GTD methodology. It also draws on wisdom I’ve gained through working with people as an OmniFocus Consultant and Trainer and is inspired by the many OmniFocus articles and training videos that I've consumed over the years. My trusted GTD system includes OmniFocus as well as other software, such as OmniOutliner, Evernote and Daylite, as well as more traditional elements, including a physical inbox and a filing cabinet (though my workflow is largely paperless at this point). Over the years I’ve looked at wide range of task management solutions — many were attractively designed and very easy to use, but also tended to be overly simplistic. I found that I quickly outgrew their capabilities. Mac Integration — The Mac version of OmniFocus is tightly integrated with many popular Mac applications. For example, through the use of a hotkey, I can select a message in Mail and create an OmniFocus task that contains the contents of the e-mail and a reference to the original message. At this point I can clear the e-mail from my inbox and manage any actions that need to be taken from within OmniFocus. Cloud Sync — The Omni Group provides a free “Omni Sync” service that keeps multiple Macs and iOS devices in sync. In my case, I use Omni Sync with my iMac, MacBook Air, iPhone and iPad and enjoy the freedom of being able to access and edit my projects and tasks from any of my devices. Offline Access — I appreciate the fact that I can access my OmniFocus projects and tasks on my Macs, iPhone and iPad, even if I don’t have an Internet connection (e.g. when I'm flying). When an Internet connection does become available any changes and additions I made while offline are synced to my other devices through OmniSync. Project and Single Action Lists — OmniFocus tasks can be added to two types of containers: projects and single action lists. A project, in GTD speak, is a clearly defined objective that requires two or more actions to complete. By definition, projects have a beginning and an end. Single actions lists, on the other hand, are essentially a bucket of tasks related to a specific area of focus and, by definition, don’t have a defined starting or ending point. OmniFocus is one of the few task management solutions that I’ve seen that distinguishes between projects and single action lists. This is a key distinction that greatly enhances the usefulness of this software. Sequential Lists — In some cases the first task on a list must be completed before the second becomes available. For example, I wouldn’t be able to send out invitations to a party if I don’t know where the party’s going to be held. OmniFocus makes it easy to define groups of tasks or even entire projects that are sequential in nature. OmniFocus can then be configured to only show tasks that are available — in this case, the next available task in a sequence. Perspectives — One of my motivations for tracking my projects and tasks through my electronic devices, rather than through pen and paper, is the ability to easily see different views of my data. For example, I may only want to see business-related projects, or may choose to focus on all of the phone calls on my list, regardless of which areas of my life they relate to. OmniFocus’ Perspective feature makes gaining access to these common task and project views very fast and convenient. More on Perspectives later. Start Date and Time — Projects and tasks can be assigned both a start date and a start time. For example, if I tell a client that I’ll call them back tomorrow afternoon, I can create a task that starts tomorrow at 1pm and can configure OmniFocus such that this tasks doesn’t show up until tomorrow at 1pm rolls around, keeping my task lists relevant and focused. Review — Regular reviews are a key component of the GTD methodology, and this is the aspect of GTD that I’ve found most challenging to implement. OmniFocus is one of the few task management applications that provides an easy way to perform and track reviews. Having this support at the software level has greatly increased the likelihood that I'll perform regular reviews and makes the review process much more efficient (and even fun). Efficiency — The folks at The Omni Group have put a lot of thought into making OmniFocus as efficient as possible. This includes the ability to efficiently perform actions, such as sorting tasks into projects and assigning contexts, using the keyboard. For example, rather than selecting a project from a menu or dragging the task to the sidebar, I can type a few letters of the project name to quickly hone in on the target project. Assigning start dates and due dates is equally efficient. Abbreviations such as “1d” and “1w” equate to a date that is one day or one week into the future. Similarly, typing “mon” or “apr 1” will translate to the appropriate day. Before delving into OmniFocus I took a look at the big picture of my life. Specifically, I started by looking at all of the responsibilities that I’ve assumed in various areas of my life and all of things that are important to me, including fun and recreation, my health and creative pursuits. In GTD speak, I took a look at my life from 20,000 feet, identifying my “areas of focus”. I expressed this information as a mind map, a graphical representation of my thoughts, using my mind mapping software of choice, MindNode Pro. This mind map document continues to evolve as I take on new responsibilities in my life and as I delegate or let go of existing responsibilities. I have shown a high level version of my mind map below. I also created a second mind map identifying the various tools, people and locations that are part of my daily life — what David Allen calls “contexts”. Having a clear understanding of these delineations up front was also key to configuring OmniFocus effectively. Once I had identified my Areas of Focus I was well on my way to setting up OmniFocus, even though I hadn’t even touched the software. I started by creating two folders in OmniFocus —“Business” and “Personal”, with the intention of creating a clear separation between areas of my life that have a business focus and personal aspects of my life. With this simple foundation in place, I created folders representing each of the major areas of my life. For example, under “Personal” I created folders such as “Car Maintenance”, “Health”, “Fun & Recreation” and “Family & Friends”. Similarly, under the “Business” folder I added various folders, including “Accounting”, “Clients”, “Professional Development” and “Marketing”. Having these folders in OmniFocus provides a basic organizational structure, while also reminding me of the many aspects that make up my multi-faceted life. Having this visual reminder helps ensure that I’m giving the appropriate amount of attention to each of these areas and helps to prevent me from becoming overcommitted. With this basic folder structure in place I went on to add projects and single action lists. As mentioned previously, projects are used for anything that has a clear outcome (e.g. “Install new car stereo”), whereas single action lists are containers for tasks that relate to a specific area of responsibility (e.g. a task called “Make appointment for annual service” within a single action list called “Car Maintenance”). With my folder and project structure in place I set out to add the appropriate contexts. Just as folders allow me to separate, for example, my business related tasks from my personal tasks, contexts allow me to easily identify tasks that are most relevant based on where I am, who I’m with and what tools I have at my disposal. I placed the most general contexts at the top level. For example, I have a context called Errands that encompasses all the errands that I run when I’m out and about. Similarly, everything that I accomplish using my computers and portable devices falls under the general heading of Technology. In some cases I defined sub-contexts to provide added granularity. For example, I often shop at Whole Foods and find it useful to have a sub-context of Errands that allows me to easily access any tasks that relate to this location. Using the OmniFocus iPhone app I associated each of these sub-contexts with a physical location and am notified by OmniFocus if I have any available tasks when I'm physically close to each of these locations. On the technology side of things, I also use contexts to distinguish tasks that can be performed on any of my devices from ones that can only be performed on a specific device. For example, I can browse a website from any of my devices, as long as I’m connected to the Internet (and assuming it’s not a Flash-based website). Such tasks are given a context of “Technology, Online”. Conversely, maintenance on my iMac can only be performed if my iMac is available. Such tasks are assigned a context of “Technology, iMac”. Perspectives are one of the most powerful features of OmniFocus. As the name implies, they make it possible to see projects and tasks from whatever angle I choose. For example, if it’s the weekend and I’m taking a break from my business ventures, I’m most interested in seeing projects and tasks that are related to the personal areas of my life. And when I’m out and about, I may be interested in seeing a list of errands in a way that encompasses both personal and business aspects of my life. I make regular use of the Perspective feature in OmniFocus and the following Perspectives adorn my toolbar. On a side note, the custom Perspective icons come courtesy of DryIcons — they have an impressive array of icons that are free for non-commercial use. Available — A list of all tasks that I could do, assuming I’m in a context that makes them available. In practice, this is a list of all tasks that are incomplete that either don’t have any defined start date/time, or have a start date/time that is now or in the past. Tasks that are complete, are not on the top of a sequential list or have a start date/time that is in the future don't appear on this list. What I’m left with is a relevant list of tasks without the unnecessary clutter of projects and tasks that are not yet available. Important — All of my tasks and projects are important. If they aren’t, why would they be in OmniFocus in the first place? At the risk of sounding a tad Orwellian, some tasks are decidedly more important than others. The tasks that populate the"Important" Perspective have either been flagged or are due today. Generally speaking, these are the tasks that get accomplished first. Business — The “Business” Perspective lists all tasks that are contained within projects in the “Business” folder that are incomplete and available. It provides me with a convenient of honing in on my business-related tasks without being distracted by things that are going on in my personal life. Business+ — The “Business+” Perspective is a refinement of the Business Perspective. It contains all available business tasks that are either flagged or due today. Personal — The “Personal” Perspective is equivalent to the Business Perspective, with the focus shifted to personal aspects of my life. I often use this Perspective during the evening and on weekends. Personal+ — Similarly, the “Personal+” perspective allows me to readily identify personal tasks that have been flagged as important or are due today. Errands — The “Errands” Perspective allows me to easily identify tasks that are available and have either a context or sub-context of “Errands”. I often use this context when I’m out and about. Conveniently, any context that I create on either of my Macs is automatically available on my iPhone and iPad. Waiting — The “Waiting” Perspective gives me a convenient way to view all of the tasks that have a context of “Waiting”. Unlike most other contexts, tasks with a context of “Waiting” are paused, meaning that they never show up on lists of available tasks. The “Waiting” Perspective helps ensure that I don’t lose track of things that I’m waiting for. I typically start my day by going through all of the tasks in the "Available" Perspective. I flag tasks that I’d like to get done that day — these tasks automatically appear in the “Important” Perspectives. Tasks that I definitely won’t get to today are assigned a start date that is off in the future or are deleted if they’re no longer relevant. Throughout the day I generally work from my “Important” Perspectives. During times of the day that I’m focused on business-related activities I work from my “Business+” Perspective and during times set aside for personal activities I work from the “Personal+” Perspective. Once all of my the tasks in my “Important” Perspectives are complete I typically go back and look at all “Available” tasks, focusing on “Business” or “Personal” as appropriate. As things come my way during the day, whether it’s e-mails, thoughts or phone calls, I capture them into OmniFocus using the Quick Capture tool. In some cases I simply add the item to the OmniFocus Inbox for later processing. Sometimes I take a few extra seconds to assign the appropriate project, context and start date to avoid the need to process the item later. At the end of the day I typically go through all of my “Available” tasks. I mark tasks complete, as appropriate and assign new start dates, if necessary with the goal of keeping my workload balanced as I go through the week. As part of this process, I sometimes use the Forecast feature on my iPhone or iPad to make sure that I’m not over (or under) committed. I also process any items in the OmniFocus Inbox. Once a week, more or less, I perform a “weekly review”. This is a key component in keeping my system current and accurate and helps ensure that nothing slips through the cracks. As part of my weekly review, I process items in the OmniFocus Inbox and review my “Waiting” Perspective. I often perform weekly reviews using the iPad version of OmniFocus. The Review feature is exceptionally well implemented on the iPad and I find that the portability of this device makes it much more likely I’ll follow through on my commitment to do the weekly review, even if I happen to be travelling at the time. I also find it useful to schedule a specific date/time for each review (an hour works well in my case) and typically choose a time that is outside of my normal business hours to minimize the possibility of being interrupted. The following are a series of best practices for using OmniFocus as part of a GTD system. They’re based on my own experiences of using OmniFocus as well as the wisdom I’ve gained through helping numerous consulting clients learn, configure and use OmniFocus. Stay Current and Relevant — Keeping your OmniFocus setup up-to-date is key in getting maximum value from using this software. Collecting data into OmniFocus is easy, but keep in mind that this is only part of the process. If you don’t trust yourself to regularly review and process what you’ve collected you’ll continue to track things mentally, which doesn’t tend to work very well in this day and age where many of us have a lot of inputs to deal with. Keep Organized — Having an organizational structure that makes sense to you is key to using OmniFocus effectively. Create as many containers (i.e. projects and single action lists) as you need with the simplest folder layout and context definitions that you can get away with. Also take care when naming each of these elements — choose names that you’ll remember later and use words that you find inspiring. A best practice of GTD is to name a project in a way that defines its outcome and includes a verb. For example, “Plan trip to Hawaii” is preferable to “Trip to Hawaii”. Make OmniFocus a Sacred Space — It may be tempting to put everything under the sun into OmniFocus, including lists of books that you might read one day and movies that have been recommended by friends. While, it’s certainly technically possible to store this information in OmniFocus, I recommend storing it elsewhere and reserving OmniFocus for all the projects and tasks that you intend to complete and not using it as a dumping ground for things that are of questionable importance. To give a few specific examples, Movies that I’d like to watch go into the Watchlist that comes with my free IMDB account and books that I have been recommended to me by friends and colleagues are added to my “to read” list in GoodReads. I also make extensive use of OmniOutliner when capturing project details and use Evernote to capture a variety of information that I may want to refer back to in the future. All of this information is easily accessible when I need it and doesn't add clutter to OmniFocus. For added convenience I often create OmniFocus tasks and projects that reference a particular source of information — for example, an OmniOutliner document or a note in Evernote. Use Due Dates Sparingly — OmniFocus is a great way of keeping track of your commitments. If I tell someone I’m going to call them next week I create a task with a start date of Monday and a due date of Friday. This way I can rest assured that this task will appear on my “Important” list the day it’s due, assuming it hasn’t already been completed. If, however, there’s no commitment around having something complete by a specific date, I highly recommend leaving the due date blank. If you use due dates arbitrarily it becomes difficult to distinguish between what’s actually due and what you’d like to get done by a specific date. If a particular task is important and is something you’d like to get done today, even though it’s not technically due, I recommend flagging the task to make it stand out from your other available tasks. Keep Fiddling to a Minimum — Unless, of course, you play the violin. OmniFocus is a highly configurable solution, which is generally a good thing as it means that you can create a setup that matches the way that you work. The potential pitfall here is that it’s easy to fall into a trap of spending hours fine-tuning OmniFocus and not end up getting much done, which largely defeats the purpose of using OmniFocus in the first place. I’ve come to think of OmniFocus as a trusted personal assistant. It provides a systematic way of keeping track of all my commitments in a way that frees my mind for more creative pursuits. Like most professional tools, using OmniFocus effectively requires that you put some thought into how you’re going to use this solution and that you take the time too learn the software. It's equally important to spend the time necessary to make sure that the projects and tasks that are stored in OmniFocus are complete and updated regularly. If you're willing to make this investment I think that you'll find OmniFocus to be a trusted sidekick that supports you in having a relaxed, productive, healthy and enjoyable life. I’d like to begin by thanking the Omni Group for all of the time and energy they’ve put into creating OmniFocus and their other productivity applications that support me and many other people around the world in a very tangible way. Owning a calculator doesn’t make you a mathematician. The GTD methodology, developed by David Allen, allows me to use OmniFocus effectively. GTD has had a profoundly positive impact on all aspects of my life and applying this methodology helped me get through the most challenging life circumstance I’ve ever faced. I wrote about this experience in an article called A Healing Journey that was published on the GTD Times blog in 2009. Later that year I was interviewed by David Allen himself as part of his “In Conversation” interview series, available through the David Allen Company’s information rich GTD Connect service. My decision to adopt OmniFocus as my personal task manager was strongly influenced by David Sparks and Katie Floyd, who co-host the Mac Power Users podcast. I listen to this podcast regularly and consider it to be one of the top productivity/technology podcasts on the Internet. Many thanks to you both for the time and energy you put into creating this podcast. Whether you’re relatively new to OmniFocus or are a seasoned user, I strongly recommend checking out a series of OmniFocus workflow videos produced by David Sparks. These videos, as well as a wealth of video content from the Omni Group and other sources, are available on the OmniFocus Video Tutorials page of the Omni Group’s website. Last, and certainly not least thank you to all of the people who have enlisted my consulting services and participated in the courses I offer through Technically Simple. I feel blessed to have the privilege to work with such amazing people and to play a role in the inspiring work that they’re doing in the world. And, I find that I gain some valuable insights through the work that I do, that ultimately help me be more effective as a consultant and trainer and more effective in my life in general. I work with people, both individually and in groups, to help them get up and running with OmniFocus and to fine tune their OmniFocus setups — ultimately supporting them in leading lives that are healthy, productive and aligned with their values. The process I go through when working with people draws upon my professional coaching training and goes beyond OmniFocus and technology. Through the consulting and training work that I do, individuals have an opportunity to look at the big picture of their lives and to reconnect with their dreams and passions. As part of this process they also have opportunity to take a close look at all of the incompletions and indecisions in their life that are holding them back and to put a plan in place to tie up loose ends. Contact me to learn more about the services I offer and to book a session or register in one of my upcoming courses. Older PostIs technology making your life simpler…or more complicated?